Funny isn't it how it only takes something just out of the routine of things, to push you over the edge? Now I am no stranger to pain, I have it 24 hours a day day in day out BUT.....a few days ago my shoulder started screaming and hasn't stopped. Did I raise my hand too high, or pick up something heavy? Who knows what started it, and it wasn't even anything I can remember so it can't have been me doing something I shouldn't, like having a life maybe!! Hubby thinks I have pulled a muscle and he could be right but Oh My God it is sending me doo lally. 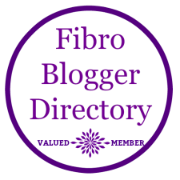 I can cope with the Fibro pain I have got used to it. I have really bad IBS days and can cope with them too, I may shed a few tears but I can deal with it, but this! I have tried heat, arnica, ibulieve, pain killers, sleep, pressure, ignoring it, distraction, everything short of cutting my arm off. A friend said I should try cold but I am miserable enough without bloody frostbite too. If anyone actually reads this and has any ideas please leave a comment. The pain is at the back under my shoulder blade and feels like burning and no matter where I put my arm the pain is constant. have read x hope you get some answers and some relief from the pain. have you looked in to chiropractor/ massage?